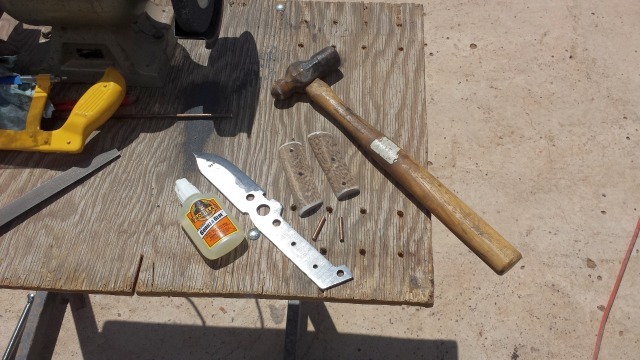 If you have some basic shop tools, or have access to them, you can teach yourself to make your own survival knives. 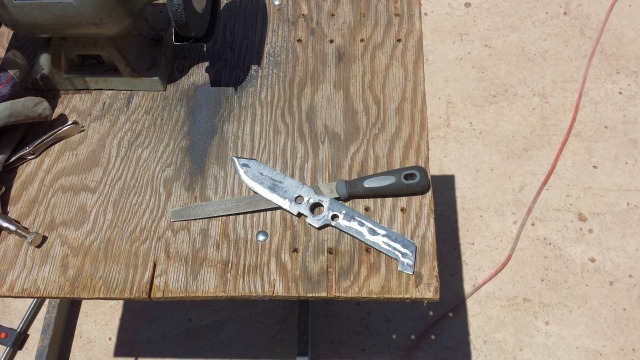 YouTube has a vast amount of how-to videos that can teach you the easiest way to make a knife. This post is to show what you can achieve with a little exploring and training. 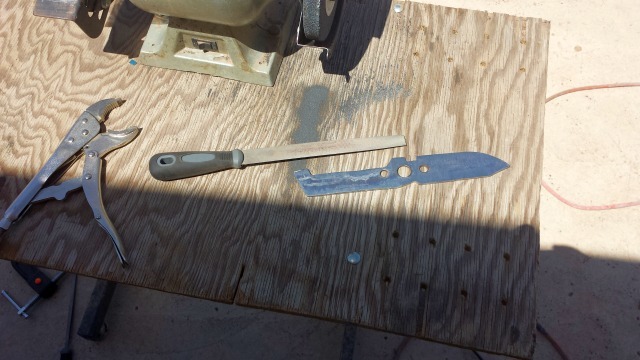 This post is not a step by step tutorial, but rather a little journey I took into the field of knife making. Here is a list of tools and materials I used to build the knives that you see here in the video and the post. Rivet gun with 1/8 inch rivets with washer backings. Basically, I start with the knife pattern I want to make. 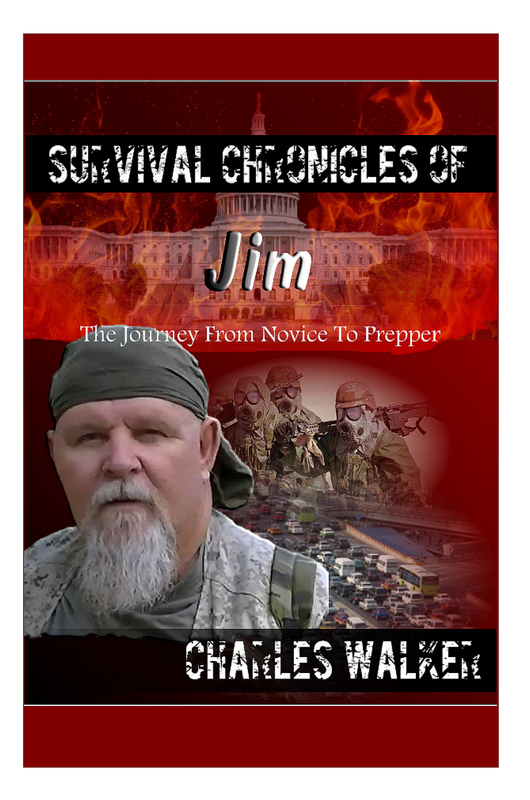 You can use Google images and search for survival knife blades and you can get many ideas on the shape of the knife that you want, or design or own. Then choose the metal you want to use for the knife. 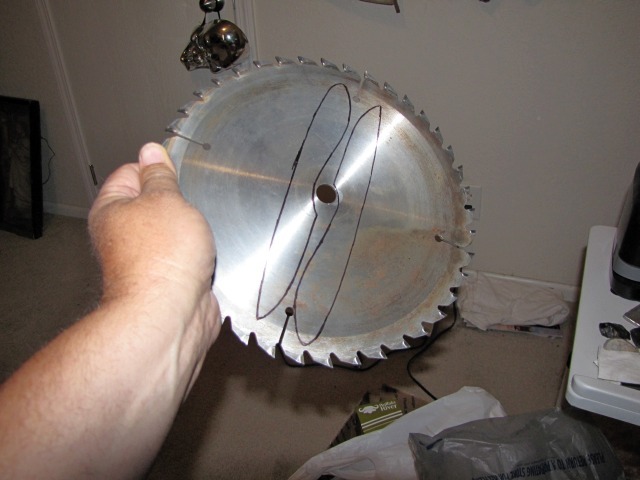 I like to use circular saw blades and lawn mower blades. As long as you do not get the metal too hot while grinding, you will not need to heat treat the metal before putting on a cutting edge. 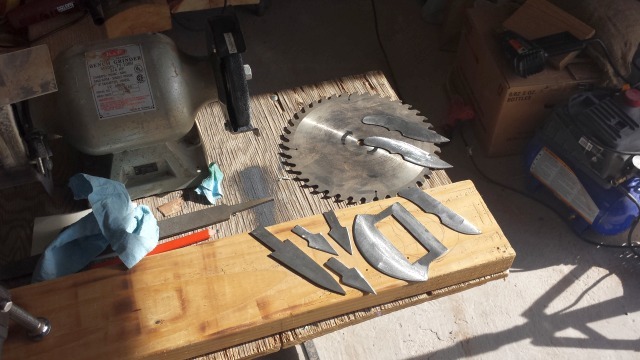 Above are blanks that were cut out of a circular saw blade and a lawn mower blade. 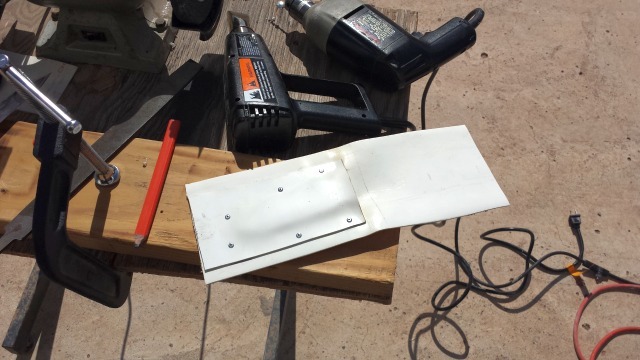 I used the table mounted grinder to take down the rough and uneven surfaces and give the knife its shape. I also use the grinder to put on the rough angle of the cutting edge. I use a hand file to take the cutting edge down to the sharpness and then use a diamond or stone sharpener to finish the fine edge. Above is a knife being cut from a lawn mower blade. 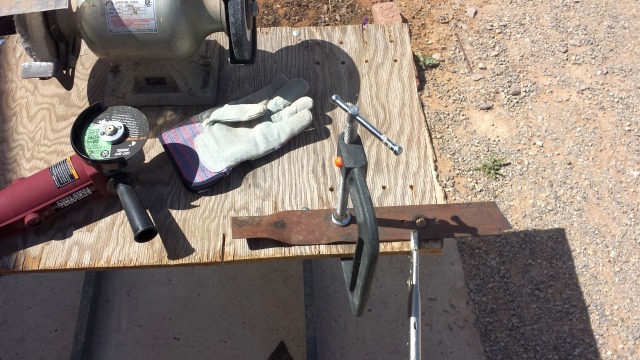 I used a C-clamp and vise grips to hold it down to the table, since I do not have a table mounted vise. I use the 90 degree hand grinder with a metal cutting wheel to cut out the knife blanks. In the above photo, I used a hand file to fine tune the cutting edge and angle and to smooth the edges of the rest of the knife. In the above photo, I am ready to add the handle. On the blade, I am using mule deer antler. I cut two brass pins to attach the handle with. I use the ball peen hammer to expand the ends of the pins so that they are larger than the drilled holes. I add the glue to the back sides of the handles before adding the pins. This gives it a little extra holding grip. Above is the almost finished mower blade knife. This is of my own design. I just need to fine tune the cutting edge with a diamond sharpener and make a sheath. I added some Linseed oil to the handle to help preserve it. Next, I used schedule 40 PVC pipe to make my knife sheaths. It is much cheaper than Kydex. I used the band saw to cut the PVC, as well as the deer antlers and mesquite that I make the handles from. 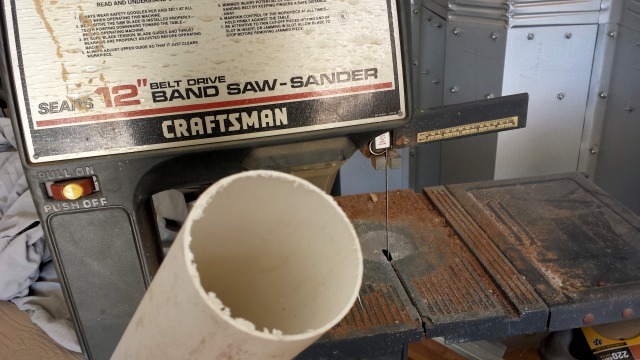 PVC pipe becomes rubbery and moldable when heated with a heat gun. I cut the pipe into two halves length wise and then heat and flatten them out to be measured for the knife. Above I have already measured, shaped and added rivets to hold the two halves of my sheath together. Now all I have to do is draw the outline for the shape of the sheath and trim it on the band saw. I then used the table sander to even the edges. Before painting the PVC, you need to rough up the surface with sand paper so that the paint will stick better. I used the type of paint that is used for plastics. 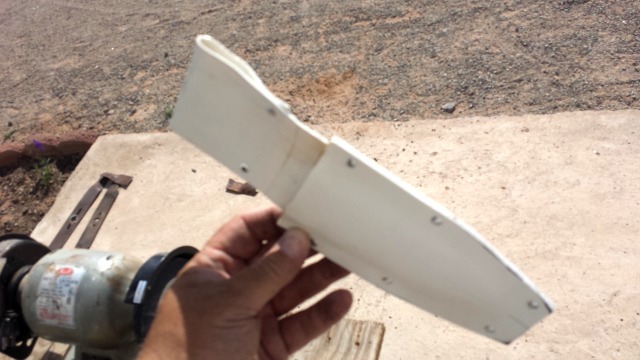 Above is the completed sheath ready to be painted. I just need to drill two holes at the bottom to put para-chord for tying to the leg or for whatever. Above are some completed knives that I have taught myself (with the help of a lot of talented YouTuber's) to make. Four of the knives are of my own design. I will be field testing them when I start my three day survival trek video. On the next sheath design, I plan on adding a place to hold a sharpener and a ferrous fire rod or maybe even a survival kit. 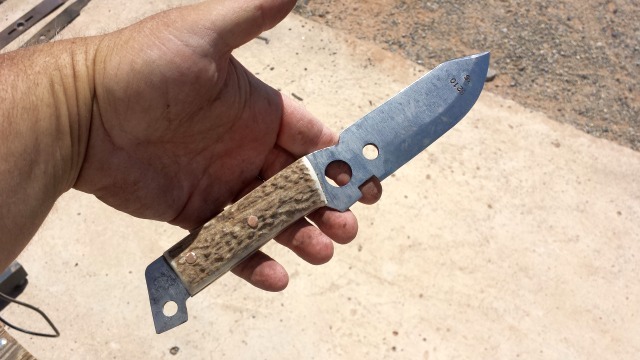 I did not think I had the ability to actually make my own knife, but when you put your mind to something and are determine to succeed, you can succeed. These knives are not show room quality, but I did not want them to be. I like the rustic hand-made look that they have and know that they are fully functional for what I intended for them to be. Go ahead! Give it a try. Design the knife of your dream. Or just have fun trying. This skill could become very handy in the near future. I love to have the various types of survival knives as this is my favorite.They help me write my essay so that I can get all the information regarding the different kinds of knives.